Circa 1900. "U.S.S. 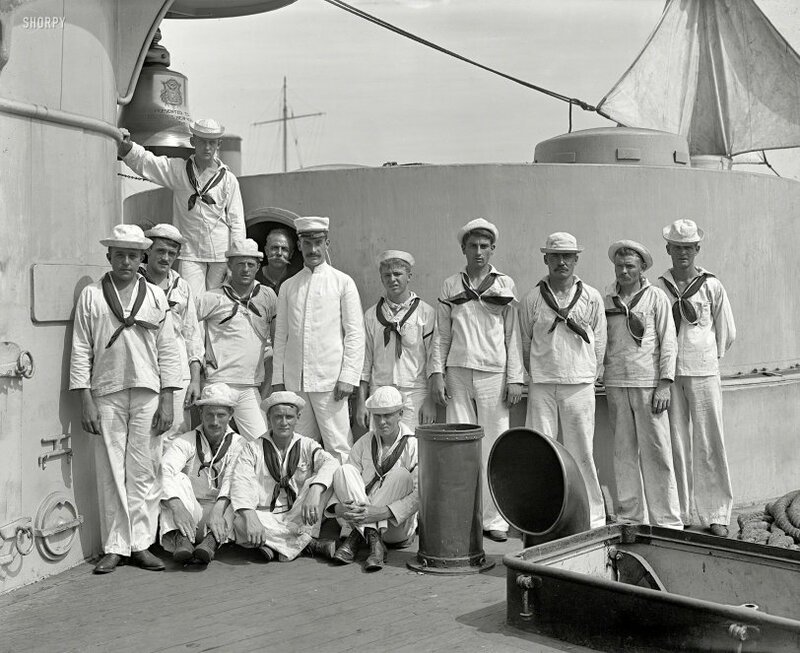 New York, crew of forward 8-inch guns." 8x10 inch glass negative by Edward H. Hart, Detroit Publishing Company. View full size. Submitted by AmerHistory on Fri, 10/09/2015 - 11:02pm. I found this photograph fascinating because the text on the bell can be read. It says the Seventh Regiment presented the bell to the USS New York. I wrote the Seventh Regiment in New York (it still exists and it has a very active association) and asked if they know anything about it. 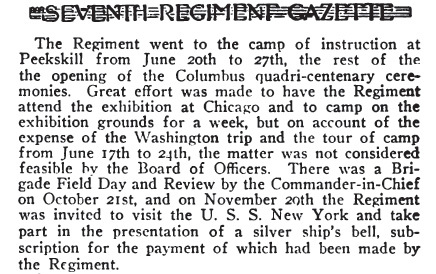 They wrote back and sent an excerpt from the Seventh Regiment Gazette. 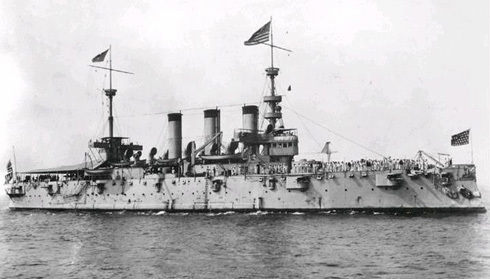 The bell was given to the USS New York in 1893. A great bit of history. A BIG thank you to Chris at the Seventh Regiment for researching this. THANK YOU! Egalitarian experiment in the Navy? Submitted by jwp on Sun, 12/30/2012 - 7:32pm. It's interesting that there's no rank insignia worn by any of these men, though several have what I believe are watch marks around their sleeves. The man in the jacket and billed hat is almost undoubtedly the chief petty officer in charge of the gun crew. At the time of the photograph, the ship had six 8"/35 caliber guns in fore and aft twin gun turrets, and midship port and starboard single gun turrets. A gun crew of eight or ten men could manage about two rounds per minute, possibly three if very well trained and motivated. The ship later became the USS Saratoga (ACR-2) and then the USS Rochester (CA-2) as the older names were needed for newer ships. At some point, the \8"/35s were replaced with 8"/45s, but seemingly only four of them, the midship turrets having been removed (the pictures on the web aren't the best). The Natty Fellow in the Center? Submitted by DRGW476 on Sat, 12/29/2012 - 3:00pm. Despite the impression given in the often posed photos of old, life back then was often a lot grittier than we're used to now in our modernistic obsession with cleanliness. What I'd like to know is who is the natty guy in the nice uniform? I'm not familiar with Navy uniforms of this era. Is he the gun officer? A petty officer? Another swabbie in his Sunday best just back from church when everyone was lining for the photo? Submitted by Solo on Sat, 12/29/2012 - 2:29pm. I shall withdraw to my muddy foxhole and wash my filthy socks in my helmet. Submitted by Kilroy on Sat, 12/29/2012 - 12:59pm. Obviously Army, you've not been aboard many modern ships to see spit and polish. Agree with your observation on 1900's US Navy, but grooming and uniform standards have changed drastically since then as they have in the Army as well. Submitted by oldbutserviceable on Sat, 12/29/2012 - 11:29am. The kite-like triangular structure Big Mike is mentioning is a called (at least in civilian service) a wind sail and directs any stray breezes into stuffy spaces of which there were many in pre-A/C days. Most ships in that period were coal fired and the coal dust gets everywhere which may account for some of the less than spiffy whites. Wind sails were in use on tankers until not long ago to help gas free tanks. Submitted by Histry2 on Sat, 12/29/2012 - 11:52am. Big Mike: I'm pretty sure the kite-like structure on the bow is a canvas 'wind sail' that caught and directed breezes to below decks areas. Sailors needed all the help with ventilation they could get on those early steel warships. Submitted by Silv Erchloride on Sat, 12/29/2012 - 10:34am. Like a window straight into 1900. I count 3 wedding rings. As for shipshapeness or otherwise, the guilty-looking guy sitting center has a dog-end put away by his boot for later! Submitted by Big Mike on Fri, 12/28/2012 - 7:08pm. The ship is armored cruiser USS New York (ACR-2) (1891-1938). The kite-like triangular structure by the bridge in both photos seems to be the giveaway. What exactly is that structure? Submitted by Charlie R on Fri, 12/28/2012 - 5:53pm. I was in the Navy 1963 to 1969 if anyone had shown up on the main deck in this condition you would have been written up and confined to the ship. I never saw any one wearing whites that were this dirty, ever! That said I HATED having to wear whites, they were starched and ironed and as soon as you sat down and then stood up they looked horrible. Give me the dress blue uniform any day. These are not "dixie cup" hats they came much later after the "flat hats".The larger ships had people that did the laundry, this is either a cruiser(New York city) or a battleship (New York state)this is most probably a cruiser because of the smaller guns, so would of had a ships laundry. Submitted by EW3 on Fri, 12/28/2012 - 2:58pm. Being ex-USN (EW3 - was my rate/rating Electronics Warfare Technician / Petty Officer Third) I really enjoy your images of older ships. Submitted by jimboylan on Fri, 12/28/2012 - 12:37pm. Earlier, someone posted the military specification for the sailors' lanyard, which mentioned it had to be long enough for the knife to be held at arm's length. Submitted by Solo on Fri, 12/28/2012 - 12:08pm. As a former Army careerist, my characterization will be dismissed by some, but the Navy has never been overly impressed by starch and polish, at least on shipboard. These jolly tars probably did their own laundry, in salt water at that, and dried it on various portions of the standing rigging. You'll notice, too, that the "Dixie Cup" or "gob cap" (as opposed to what came to be know as the "Donald Duck" hat, now long gone) has the unique ability to accept the wearer's individual styling inputs and still look like something that came off a milk bottle. Submitted by Larc on Fri, 12/28/2012 - 11:00am. It looks as if some of the guys slept in their uniforms a couple of weeks before they wore them for duty. Submitted by Ice gang on Fri, 12/28/2012 - 10:30am. what is on the ends of those lanyards? a knife? a bosun's whistle? - - help.